We have a very set meal schedule in our house based on my work schedule: take out on Fridays, Rachael Ray meals on Saturday, Sunday, Monday and Wednesday, and entrees I have pre-made and frozen on Tuesday and Thursday (I get the recipes for those from Fix, Freeze, Feast). On the days I work, the prepared meals are great, but I don't premake side dishes. I make a bunch of differnent entrees, so we have lots of variety there, but I have been in a major rut for side dishes - it's always veggies and rice. After searching through my pantry for some inspiration, I found orzo, searched the Food Network website, and came across this Cheesy Orzo recipe. It can be made with stuff you probably have lying around and it will create a little variety for you, too! Melanie of My Kitchen Cafe adapted a Rachael Ray recipe to make Moo Shu Noodles. 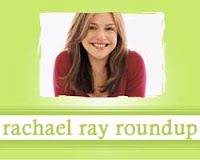 Cheap Healthy Good compares Rachael Ray to J-Lo and gives her Chickpea Salad a great review. Elizabeth Passarella of The Kitchn thought of a bunch of uses for the flat brownies used in the Brownie Ice Cream Sandwich recipe from Everyday With Rachael Ray. Enrico of Hotel Tuesday made Rachael's recipe for Chicken Catch-a-tory Ravioli Stew. Laura Flowers of The Cooking Photographer made Rachael's Super Sloppy Joes. Lauren of Food for Living might not be a fan of Rachael Ray, but she is a fan of her recipe for Chicken Parm Meatball Subs. Jennie of Adam's Brag Book made Spring Chicken Roll-Ups with Lemon Dijon Pan Sauce. April of The Fragrant Hand made a recipe I tried recently and loved - Pesto Chicken Grill Packets. Rachael gives a hint to Newsweek that she doesn't appreciate being lumped in with Sandra Lee. Gotta say I agree with Rach on this one - her recipes don't rely on prepared foods like Lee's do. Diana Bauman of the Des Moines Cooking Examiner tweaked Rachael's recipe to create Pissaladière with crème fraîche. No Meat Athlete made Racahel's Portobello Mushroom Burgers. Krystal of Recipes of a Cheapskate made New England Pasta Bake. Laura of Real Mom Kitchen made Pork Kebabs from Every Day with Rachael Ray.